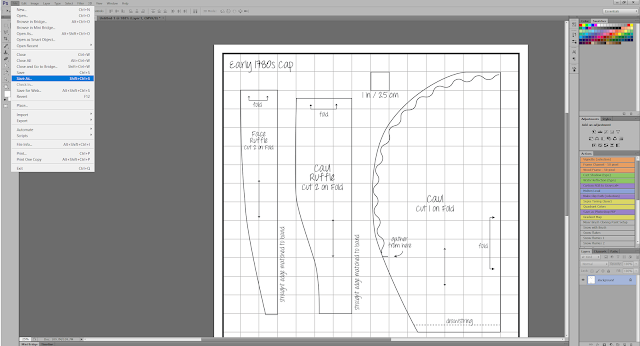 If you've been into historical costuming for any amount of time, you will be familiar with many a book featuring gridded (or scaled) sewing patterns. The Tudor Tailor, Patterns of Fashion (all of them), Period Costume for Stage and Screen, and The American Duchess Guide to 18th Century Dressmaking all have gridded patterns...but little to no information on how to scale these up. 1. Scan in the gridded pattern you wish to use. It's important that you get a good, straight scan with no distortion. Open the scanned file in Adobe Photoshop. 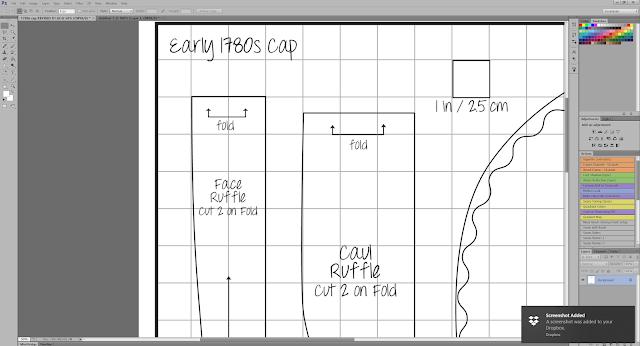 Open your scanned pattern in Photoshop. I am using the 1780s cap pattern from The American Duchess Guide to 18th Century Dressmaking in this example. 2. 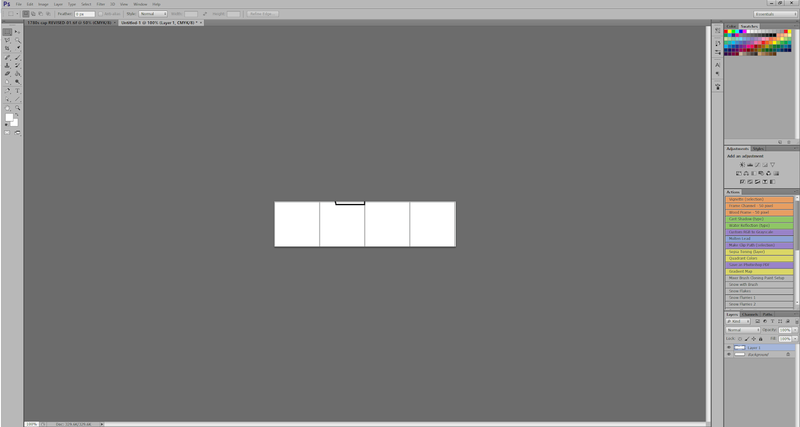 Using the selection tool, draw a box around 4 grid squares. Right click and select "copy" ( ctrl-C). 3. Create a new file (File > New). When the new file box comes up, it should have the dimensions of the copied portion of the grid already in place. 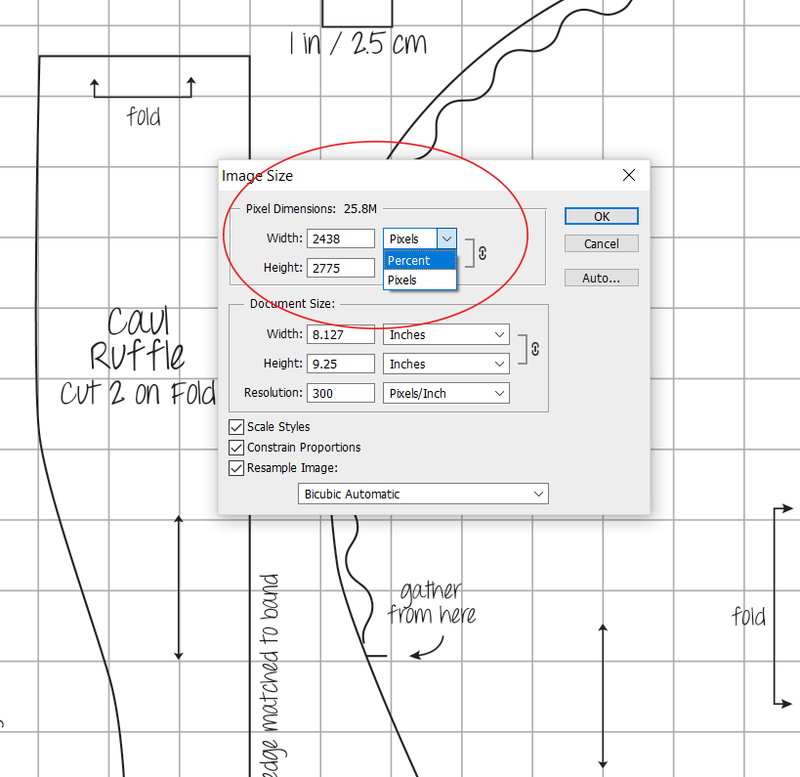 Click OK.
You don't have to change anything on this new file box, so long as you copied the four squares - it gives the dimensions of the copied portion automatically. 4. 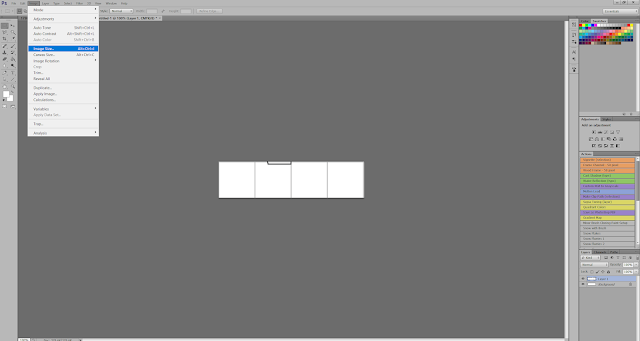 The new file will open with a long, skinny aspect ratio. Paste the 4 squares (ctrl-P). 5. From the "Image" dropdown menu, select "Image Size." 6. 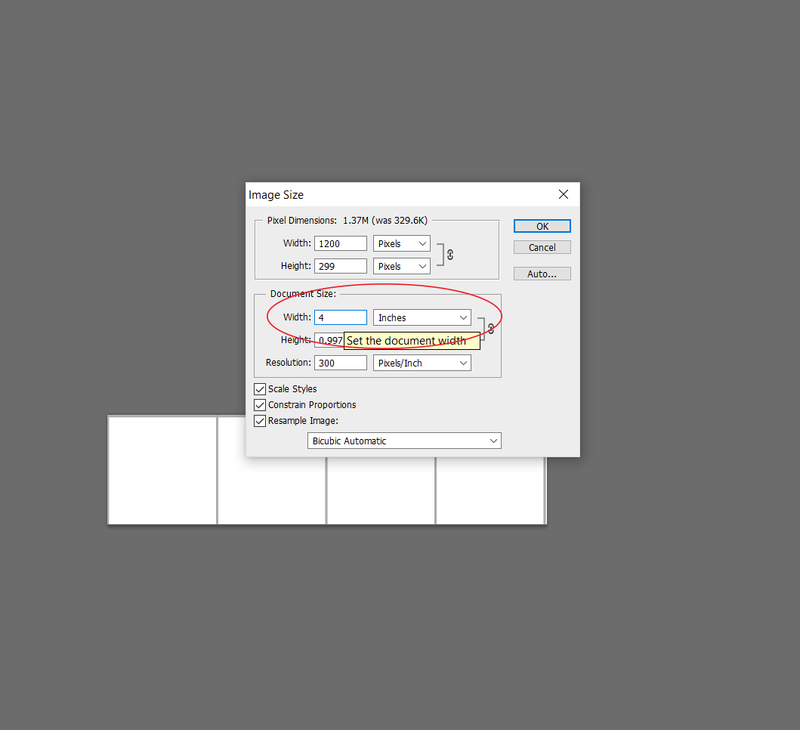 The Image Size dialog box will open. 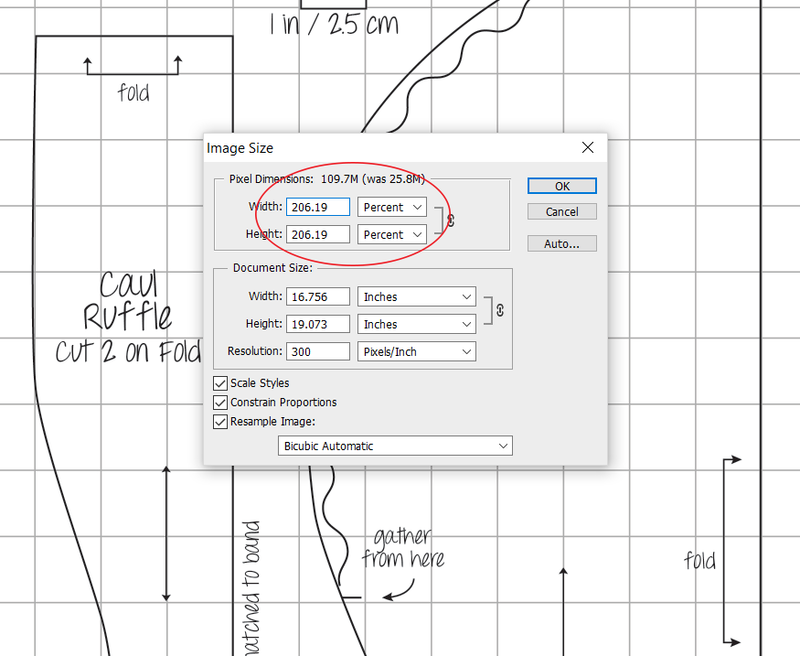 Under "Document Size" in the middle, set the document width to 4 and make sure the unit measurement is "Inches." The 4 corresponds with the 4 squares you selected earlier. 7. 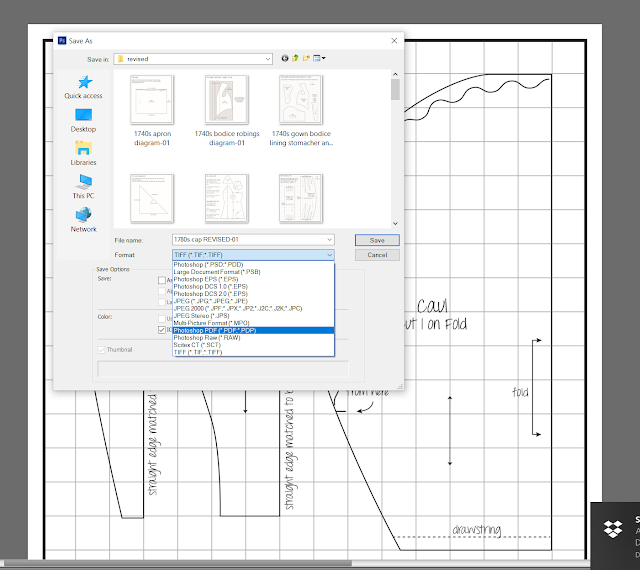 Still in the Image Size dialog box, click the dropdown arrow next to "Width" in the Pixel Dimensions box (the top box). Select "Percent." The number in the "width" box will change - write this number down. In my case the number changed to 206.19. The "1200" in this screenshot changed to "206.19" after selecting "percentage" here. Write this number down! You'll need it later. 8. 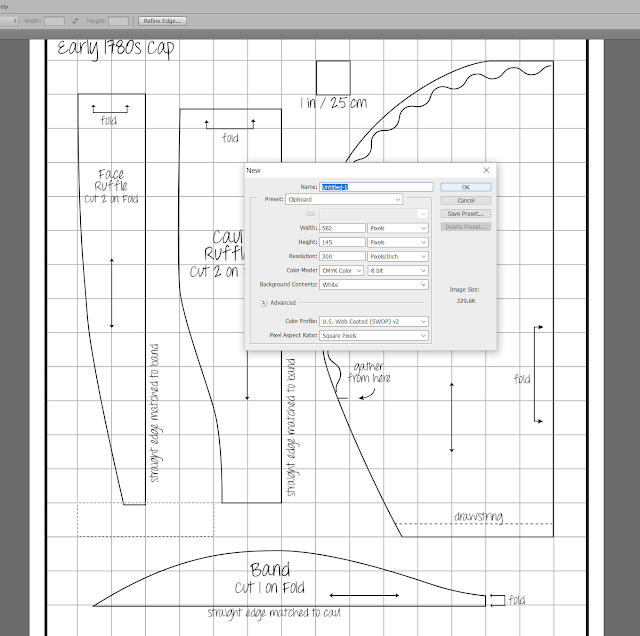 Going back to your scanned pattern file, click the "Image" dropdown menu at the top and select "Image Size." 9. 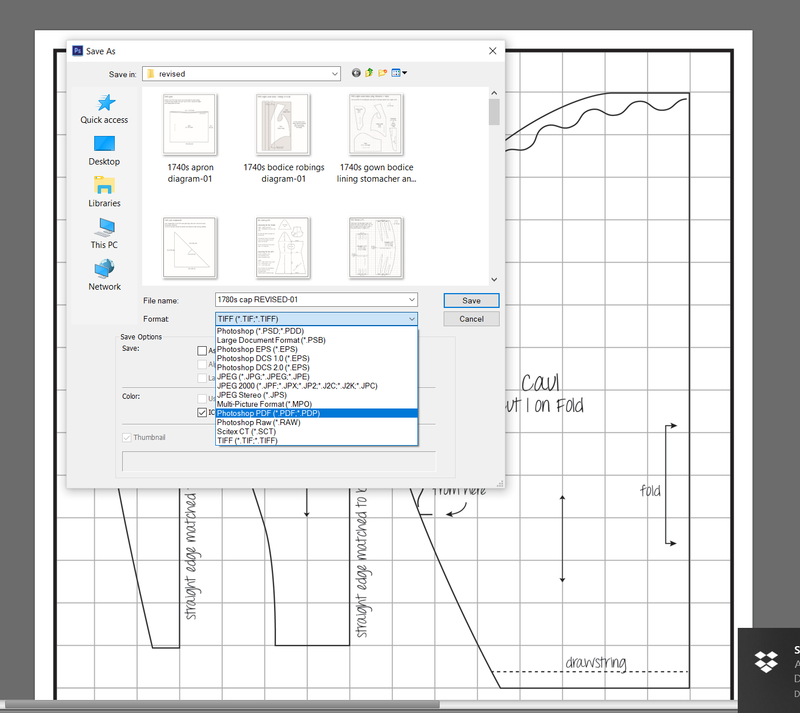 In the Image Size dialog box, click the dropdown menu next to "Width" in the Pixel Dimensions box (at the top), and select Percent. You will see the number in "Width" change. Once you select "percentage" the number to the left will change. It won't match the earlier 206.19. You have to do that manually in the next step. 10. 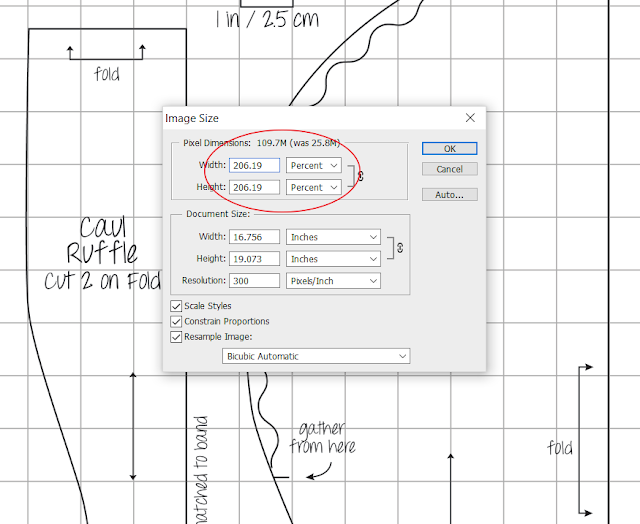 Change the "Width" number to the percentage number you wrote down in step 7. Click OK.
11. You will see the file auto-scale. 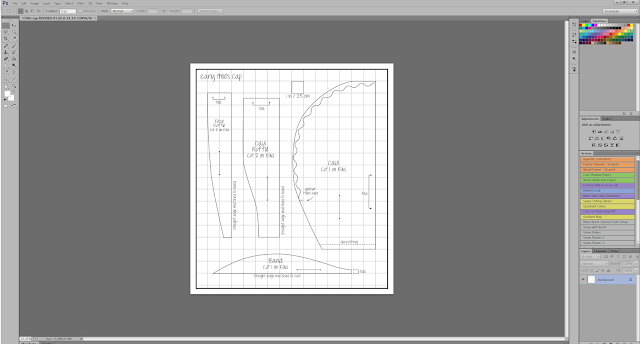 This is now at actual size and the grid boxes should be 1 inch. 12. In order to print out and use your pattern, select "File" from the dropdown menu at the top, then "Save As." 13. 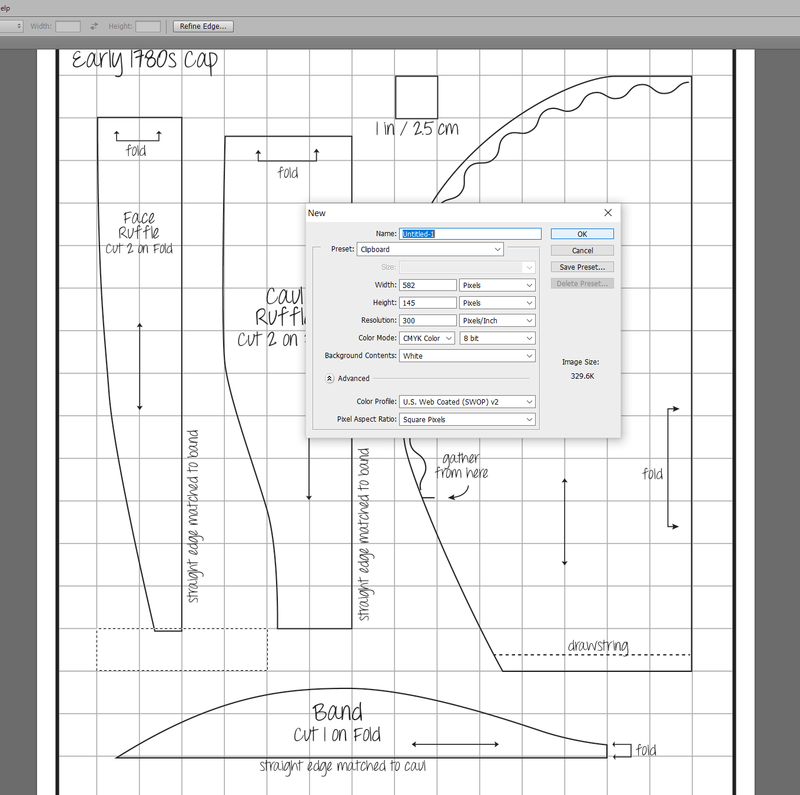 In the Save As dialog box, select "Photoshop PDF" from the Format dropdown menu. Rename the file and save it. 14. 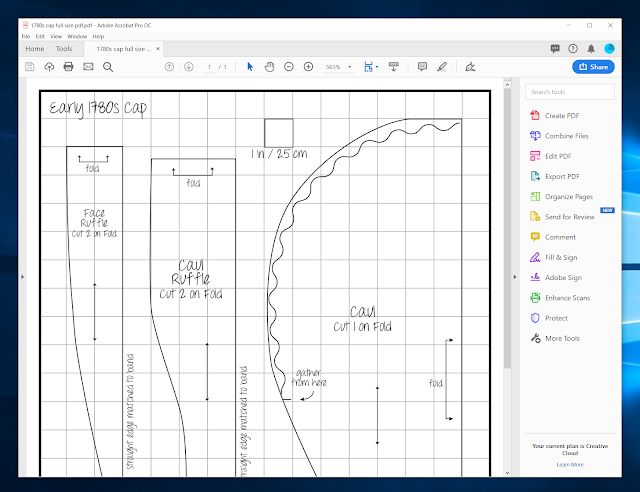 Now open the PDF file in Adobe Acrobat. 13. Select "Print." 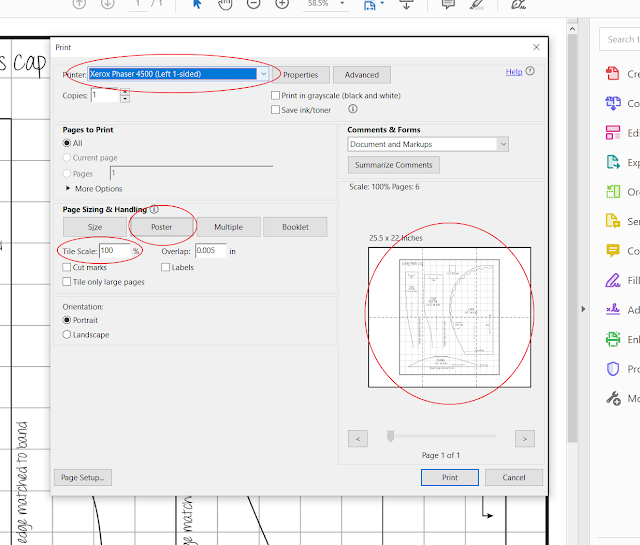 Set the correct Printer at the top (if you have more than one), then click "Poster" under Page Sizing & Handling. This tiles the image. Under "Tile Scale" it should say "100%" and there should be about a 0.005 Overlap. No other adjustments need to be made unless you want to play around with the cut marks, labels, or paper orientation. Click "Print." Check these four places in your Adobe Acrobat Print dialog box. 14. Before you print the entire tiled document, print just one of the pages and check the scale against a ruler. Make sure those boxes are 1 inch. If they're not, make sure your printer scale is 100%, and/or revisit the scaling instructions above. Once you're happy, print the entire document. Print one page out on paper and check the printed grid against a ruler. It should measure 1 inch by 1 inch exactly. 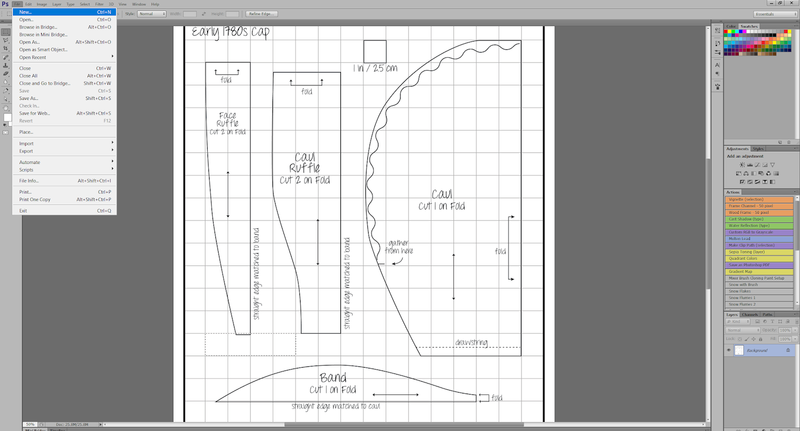 For a small cap pattern like this, it took only 6 sheets, but dress patterns can take many, many more. Tape the sheets together, overlapping the edges and getting the grid to line up in both directions. 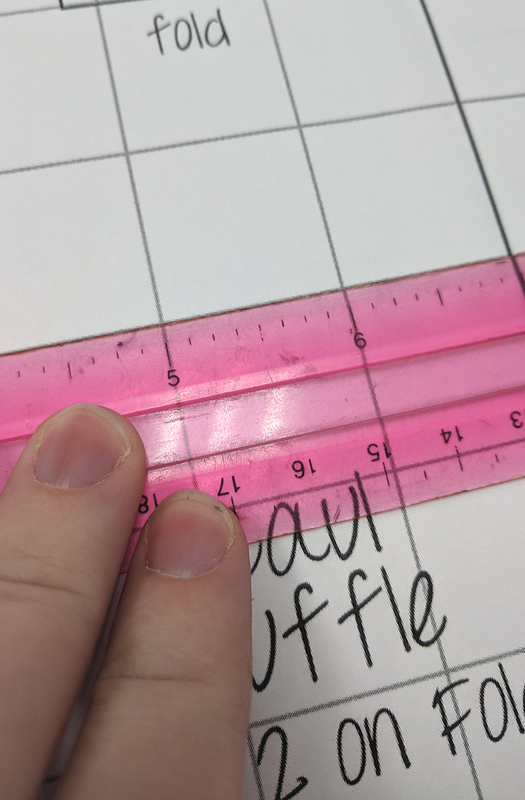 Most gridded patterns in books do not have seam allowance. There may be enough space to add it on the taped-together pattern, or you may add it as you lay out and cut your pieces on fabric. Lastly, simple patterns like caps don't need size adjustment, though you can certainly reduce or increase scale in Photoshop before printing. Dress patterns, on the other hand, are usually taken from real women's clothing and are not a one-size shot. Your pattern will need adjustment. Some of this can be done in Photoshop prior to printing, but in all cases, you'll want to do a mockup and futz from there. While this is not the only method, it's one of my favorites. 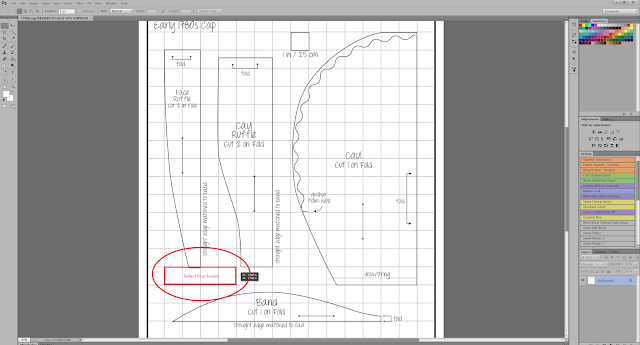 Please note I'm using Photoshop CS6 in this tutorial. 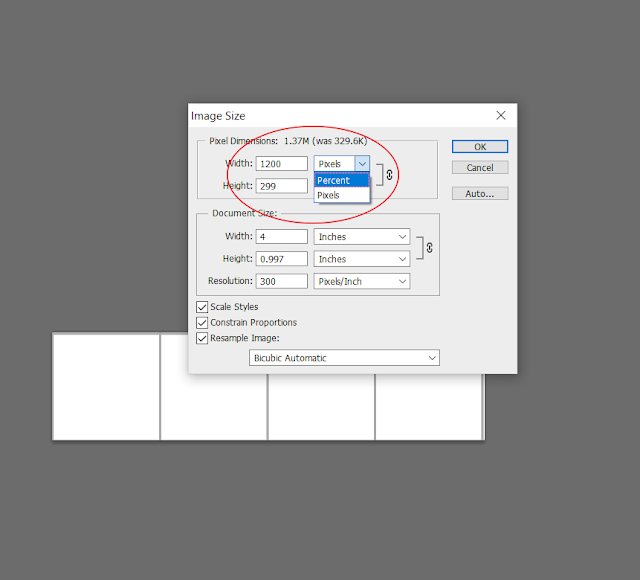 Newer and older versions of Photoshop may have some functions in slightly different places, but generally speaking the Image > Image Size dialog box hasn't changed much in a very long time. 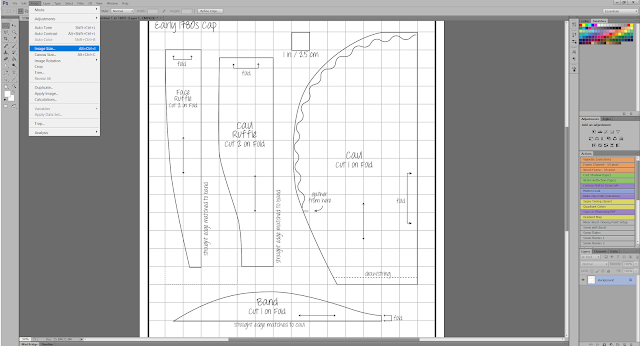 There is also the "Really Down and Dirty" Method that uses MS PAINT, you open the image in Paint and when you print it you can scale it up (800% usually works) in 'Printer Options/Settings' You may have to fiddle with the scaling settings depending on the resolution of your scan but hey, it works! ShadowWing if it was a dress pdf and you wanted to go up a dress size how do you work out what percentage to take it up to? I would simply place the image in Illustrator at 100% (whatever it drops in as)...then measure a grid square. Say it measures 16mm and you want it to be 25mm (sorry I am aussie and cant use inches well for this kind of thing). All you do is divide 25 by 16 which equals 1.5625 - this becomes your percentage you need to scale up by moving the decimal: 156.25%. Scale your drawing equally by that much and bam done. I do this kind of scaling in my job every day so I've got it down pretty efficiently! All you need is the equation and knowing if you are scaling up or down. If you are scaling down you just reverse it - 16 divided by 25.